> Bees are waking up. Bee ready! Sorry for the gap in these blogs, wow time does fly when your a beekeeper! So the weather is on the change and a few sunny days have brought out some flowers, The trees are now budding and our bees are bringing in the first pollen on 2015. Our advise is to BEE PREPARED! Now is the time to make a concise list of all the equipment you need to either replace or upgrade. Get all your frames nailed and waxed. We suggest making far more than you think you will need this year. Its better to have too much, than not enough. We see so many panicked beekeepers coming in the shop desperate for a super, brood box, queen excluder, because their bees have over developed beyond what they imagined or prepared for. 1 Hive stands in good shape? Need a paint up or repair. 2 Extra supers and brood boxes in reserve and ready. 3 Ample smoker fuel ready for the season. 4 2015 Action Plan. Consider what you wish to achieve this beekeeping year and make it happen. 5 Review your 2014 beekeeping notes ands learn from your mistakes or achievements. 6 Clean, clean, clean.. Make sure all your equipment is clean and ready. 8 Keep them protected from woodpeckers, mice, winds, falling branches and vandals. 9 Check all your honey extraction equipment is in good working order before it is needed. 10 Check your protective cloths to make sure they are still bee proof. 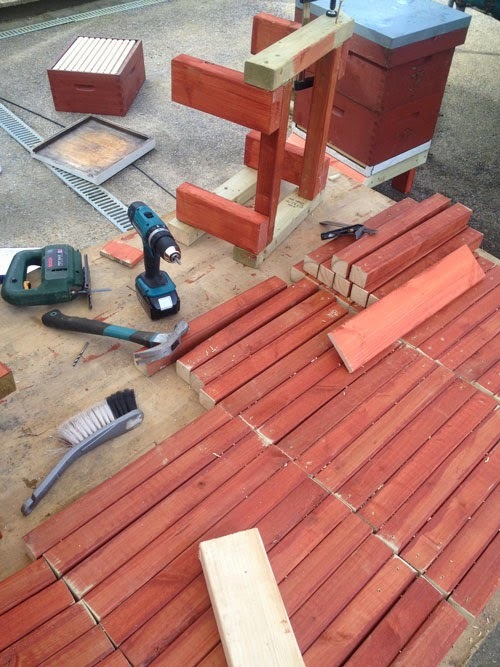 We have begun our 2015 prep for the year ahead and have been making hundreds of wooden beehive stands over the last weeks. We all enjoy crafting hand-made bespoke beehive parts for our apiary sites. There is nothing as enjoyable as working with fresh sweet smelling wood and cutting, shaping and finishing off the part in the great open outdoors.